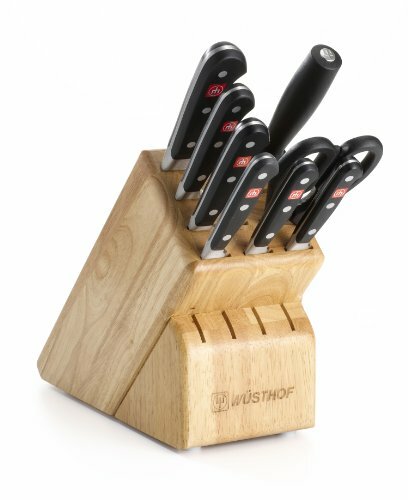 Wusthof Classic is triple-riveted and forged from one pc of specially tempered high-carbon stainless steel to ensure outstanding strength and extraordinary sharpness which is easy to maintain. For professional chefs and home cooking enthusiasts alike. Set Includes: 3.5"-Paring Knife 3"- Peeling Knife 6"- Utility Knife 8"-. Carving Knife 8"- Bread Knife 8"- Cook's Knife 9"- Sharpening Steel Come-Apart Kitchen Shears 13-slot Knife Block Features: Specially alloyed stainless steel Seamless, hygenic fit of handle Triple-riveted handle shells, full-tang handle Wusthof's newest state of the art technology incorporates a new computer controlled method for putting the edge on Classic knives. This technology allows for an exacting edge from the tip of the knife down to the heel of the knife. With this newer precision, the knives are made sharper to 14 degrees per side for a total of 28 degrees. The knives are now sharper and this refinement increases the sharpness retention because exacting angles and edges last longer than edges sharpened by hand. The result is a knife that is 30% sharper and the ICP (Initial Cutting Performance) lasts twice as long.